So, you might know that I got married just over two years ago to a wonderful man named Ed. And on April 29, our anniversary, I shared how I met him. What I HAVEN’T written much about is our wedding. I LOVE telling stories about our wedding. I love hearing stories about other people’s weddings. I love TELLING stories about other people’s weddings. And if, like me, you’ve not written out your wedding story, this is a good opportunity to get those memories on paper. So to speak. As with the last carnival, Mister Linky will be there, so you can add your link and then visit other wedding story blogs. I cannot wait. Tell your friends. Have your friends tell their friends. Put the button on your blog. 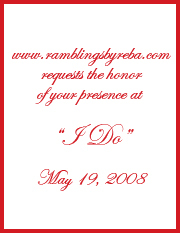 Pingback: Ramblings by Reba » Blog Archive » We love love! Pingback: Ramblings by Reba » Blog Archive » Experiencing technical difficulties? Please stand by.